EcoPayz is one of the oldest, most trusted and widely used e-wallet companies on the web. Their easy to use, reliable service has kept online poker players smiling for the last fifteen years and the fact that you can use EcoPayz globally means its popularity has just grown and grown. Players gambling from countries with tight restrictions on real money poker play have discovered that using EcoPayz is a great way to get around any issues with depositing and withdrawing. There are loads of other upsides to using EcoPayz too. You don’t need a bank account, customer care is on hand night and day and transaction fees are way lower than they are at other leading e-wallet sites. Our #1 recommended legal ecoPayz online poker site for April 2019 is Ignition Poker . If you play on poker sites, ecoPayz is a great way for you to deposit your money and withdraw your winnings. It is actually a great payment solution for a number of online activities, including selling, buying, and playing online poker. ecoPayz is an online payment solution that is available to poker players in 159 different countries. It handles 45 different currencies (including USD, EUR, GBP, JPY, and CNY). You can add as many currencies as you want to your account. (Here are the instructions for doing so). This enables you to manage your online EcoPay account and accept or make payments rapidly and easily right on the Internet without having to enter any sensitive financial information (such as your credit card number). Your financial information is already stored in ecoPayz’s system, so you can just log into your ecoPayz account and manage your deposits and withdrawals in a matter of minutes. Those come with ecoAccounts. Any ecoPayz poker player can opt to carry up to three ecoCards, which they can use to access the funds via an ATM. You also have the option of using virtual one-use cards if you need to purchase something online without worrying about having your sensitive financial information stolen or compromised. As soon as the virtual one-use card is used, it immediately expires and can no longer be used elsewhere. This enables businesses to entirely manage their salary payments, commissions, and one-off payments to their own employees and other businesses. It is also available in online payment accounts and prepaid MasterCard cards for employees who need to use the business account. This enables businesses to accept payments from customers all over the world (as long as they are using one of the 45 currencies accepted by ecoPayz). Some added bonuses that come with this account are fraud and chargeback protection. What are some of the advantages of using ecoPayz? If you already (or plan to) frequently use ecoPayz, poker sites, and online gambling sites in general, we have good news for you: there are boatloads of advantages that come with using ecoPayz! That means you can exchange money with virtually anyone around the globe. Let’s say you are playing in an ecoPayz poker room at 3 o’ clock in the morning, and you suddenly run into a problem. It will be completely okay because there is a customer service agent who is fluent in your language just waiting to help you out, even in the middle of the night! There is a free app available for Apple & Android mobile users. As for other types of mobile users, there is a mobile site you can use on the go. In fact, you do not even need a bank account to open up an ecoPayz account. It runs independent of a bank account. Canada players can also get rewards and special offers at ecoPayz, as well! ecoPayz gives their users access to a number of global money saving deals. Can Ecopayz be used for online poker? Absolutely! 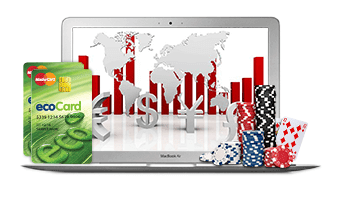 Many online casinos accept ecoPayz. Check out the list above (or below?) for some of the most popular poker sites that accept ecoPayz. Do they offer fast transfers? Yes. According to ecoPayz.com, money transfers are instant and you can send out or receive funds in a matter of seconds. Are there benefits compared to other similar platforms? Yes. The fees are generally lower. Also, it is completely free to transfer funds from one ecoPayz account to another. This cannot be said about a lot of digital wallets out there. For instance, you still have to pay a rather hefty fee to transfer funds from one PayPal account to another. Registering at ecoPayz is generally easier than registering at some other online payment processors. At ecoPayz, you do not need to verify your account. All you have to do is to add funds to your account, transfer it to an online casino, and start playing poker right away. With PayPal, it usually takes a few days to verify your account. However, you do have to verify your ecoPayz account before withdrawing your winnings. Do I require a credit card? No; credit cards are not required to open or maintain an account with ecoPayz. ecoPayz is basically an independent online bank account that does not need to be attached to a credit card or bank account. However, you do have to fill your account with funds, so you will need to transfer some money from your credit card or bank account at first in order to get started with ecoPayz. When you are ready to withdraw your winnings, you can simply visit the cashier on the poker site you are using and then transfer the winnings to your ecoPayz account. Just select the ecoPayz option on the poker site and then log into ecoPayz. Of course. You are subject to fees and charges for withdrawals, deposits, fund transfers, and account inactivity after 12 months. The fees are usually pretty small, but the exact fee you have to pay depends on the service you choose and the region and country of residence. Check out ecoPayz’s ecoAccount Fees and Limits page for a comprehensive list of all of the fees you are expected to pay. Playing online poker for real money with the help of ecoPayz is awesome if you do it on the right websites. As any experienced poker player will tell you, there are plenty of bad rooms on the internet that everyone should just keep a distance from.